First, on soprano cornet we meet Catherine. Catherine’s another Woodhouse local and is actively involved in the local church community. On Second Cornet we have Chris, Ed and Lydia. 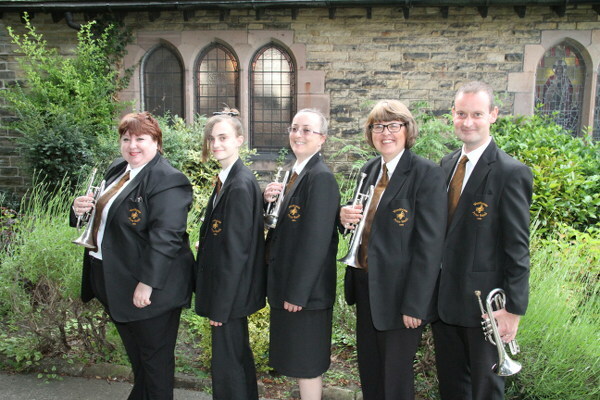 As well as playing cornet with Woodhouse, Chris is seen playing cornet or timpani with Chapeltown. Ed is a relative newcomer to the band. He played whilst at school, then after hearing the band performing at his church though it would be nice to see if his lips still had it in them to play. They did, and he’s come a stalwart of the back row! Lydia is one of our younger players, quite an accomplished musician, playing piano as well as cornet. On Third Cornet we have one of our newest members and one of our longest serving members. Linda recently joined the band after picking up cornet only a few months earlier and being pretty much self-taught up to that point. Sat next to Jeanette (Gemma’s mum! ), she’s getting a guiding hand through some of the more tricky bits and is certainly learning from Jeanette’s years of experience. They are joined by Lindsay, daughter of Jeannette.